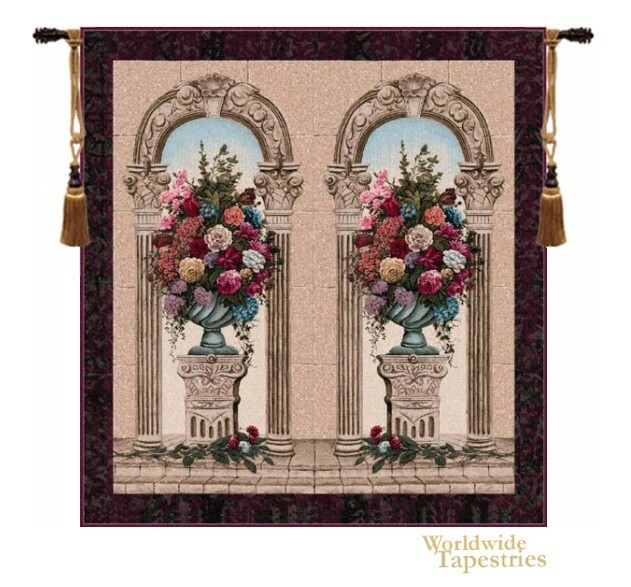 This Floral Arch Duo tapestry shows a gorgeous arrangement of flowers in a duo archway. The colors of the blooms are simply beautiful as the crimsons, mauves, pinks and blues combine to create an almost surreal bouquets. The classic archways provide the backdrop for the duo of urns perched onto pedestals,. A rose branch strewn on the ground is before each arrangement. This is a classic still life with inspiration from Roman and Greek art, yet with a modern color palette. This Floral Arch Duo tapestry is backed with lining and tunnel for easy hanging. Note: tapestry rod and tassels, where pictured, are purchased separately. Dimensions: W 61" x H 66"